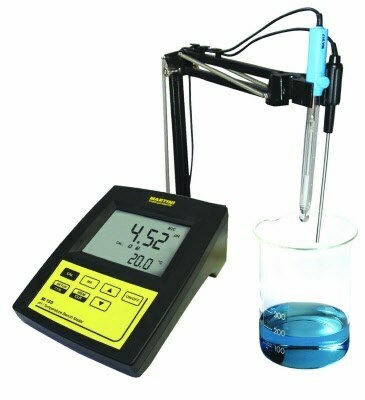 Milwaukee MI180-US measures 6 different parameters: pH, ORP, EC, TDS, percentage of NaCl and temperature in a variety of ranges. MI180 lab grade meter measures 6 different parameters: pH, ORP, EC, TDS, percentage of NaCl and temperature in a variety of ranges. The Milwaukee Mi180 measures 6 different parameters: pH, ORP, EC, TDS (Total Dissolved Solids, percentage of NaCl and temperature in a variety of ranges. pH calibration can be performed in 3 points selectable between 7 memorized buffers, to provide a very accurate calibration curve even when testing different samples, where very wide differences in pH can be found. The Milwaukee Mi180 auto-ranging feature for EC and TDS measurements automatically sets the resolution suitable to the tested sample. All measurements can be temperature compensated at 20 or 25°C and the compensation coefficient is selectable by the user. The automatic temperature compensation can also be disabled for measuring the actual conductivity value. The stability indicator on the LCD ensures accuracy. Conductivity readings are performed with the 4-ring probe supplied with the meter. The GLP feature allows users to store and recall data on system status. PC compatible through an RS232 port or USB.